The documentary film ”Legacy. I never left my Village” produced by the International Raoul Wallenberg Foundation (IRWF), based on the idea of its founder, Baruch Tenembaum, was awarded a distinction on the 30th. 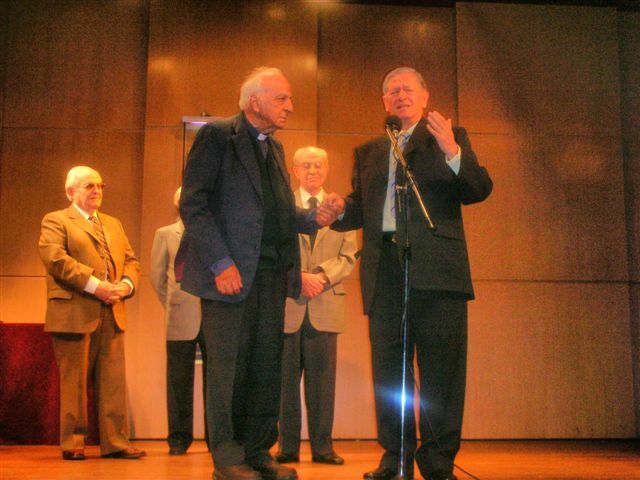 of November 2005 by the AMIA (Israelite Argentine Mutual Association), in a ceremony which took place in the central auditorium of the Jewish Argentine community headquarters. On behalf of the Wallenberg Foundation, the award was received by its president, Father Horacio Moreno; the vice-president, Natalio Wengrower; and Ricardo and Israel Faerman, both Directors of International Relations of the organization founded in Argentina. The prize also went to the IRWF, for the importance of its cultural and educational enterprises. Moisés Korin, Cultural Director of the AMIA and Lyor Haiat, Cultural Attaché of the Embassy of Israel, were the persons in charge of giving out the prizes. 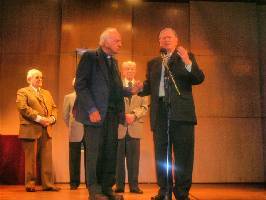 The film directors Vivian Imar and Marcelo Trotta, selected by Tenembaum in 1992, were rewarded with the Prize Argentores 2004, together with other national and international recognitions, due to their ability in directing the film. They were grateful to Ana Weinstein, Director of the Centre of Information and Documentation on Argentine Judaism belonging to the AMIA, for her valuable collaboration in contributing historical documents. ”Legacy. I never left my Village”, is a documentary film which narrates the saga of the Jewish colonization in Argentina, edited in a DVD format and it can be bought with subtitles in English and French. Shifra Lerer, mythical Argentine actress of the Idish theatre, who has been living in the United States for many years, received a special mention. 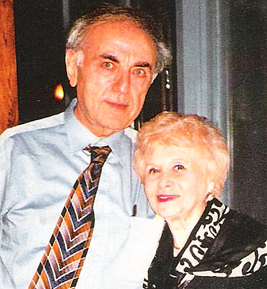 Shifra, who is 91 years old, became world known in 1997 when she played one of the leading parts in the Woody Allen film ”Deconstructing Harry”. In ”Legacy” Mrs. Lerer’s voice is used for the part of a grandmother who remembers her arrival to Argentina on the ship ”Wesser”, in 1889. Her ”voice over” creates the central story which branches out, giving form to the whole narration. The actress Cristina Murta is Esther’s voice, her granddaughter. The documentary is just one of the links of the chain of cultural events which have taken place during four decades of uninterrupted work by the IRWF and its associated interconfesional organizations. Between these achievements we must mention, the Memorial Mural for the Victims of the Holocaust and of the criminal attacks against the AMIA and the Israeli Embassy; installed inside the Metropolitan Cathedral of Buenos Aires, and inaugurated in 1997 by the Cardinal Antonio Quarracino. This monument, with no precedents the history of Jewish-Christian relations, has been admired, since its inauguration, by more than five million people and the Argentine Central Post Office has issued a stamp to commemorate it. In November 2004 a replica was inaugurated in Berlin. We must also remember the fresco ”Basílica de la Anunciación (Basilica of the Annunciation)” painted by the great artist Raúl Soldi in 1968, in the Basilica of Nazareth, Israel. This painting is a tribute to the Virgin of Luján, it is situated in the Holy Land and is a symbol of the necessary understanding that must reign between the sons of the three great monotheistic religions. The Parish Priest, Annemarie Werner, has sent a letter of thanks from Berlin, in which she announces a special prize granted to the film, awarded by her congregation, due to the exaltation of the values of dialogue and Jewish-Christian understanding.